The Scottish referendum was always going to be one of the year’s most important political events. The fact that a vote for the union won by a healthy majority does not lessen that in any way. An 85% turnout there was truly remarkable, and the astonishing level of political engagement that number suggests must be taken into consideration when looking at the current polling. Labour no longer look a comfortable bet to take a majority of the Scottish Westminster seats – throwing all of our previous predictions for the next election into turmoil. With the referendum, the Gordon Brown speech and the election of Jim Murphy all among 2014’s biggest moments for the Labour Party, we can be sure of one thing: Scotland won’t be ignored or taken for granted in 2015. 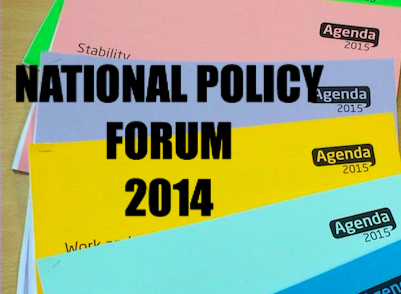 Labour’s National Policy Forum was definitely a high point for the Party in 2014. Run in an open and consensual way the policy discussions had there were both open and radical. We developed a policy programme radical in scope and a vision for a new kind of Britain. We also got a glimpse of a new kind of Party – the better Party we can be when we develop our policies together. Members and MPs working together rather than at loggerheads. It was Inspiring. Credit should go to Angela Eagle and Jon Cruddas for working so hard to create the correct atmosphere. The curious world of Westminster journalism threw up a real cracker this autumn – some musing from the editor of the New Statesman, a sketchily-sourced Telegraph splash, and finally an Observer front page claiming that “20 shadow ministers” were ready to move against Ed Miliband if Alan Johnson wanted the leader’s job. The (non-) coup was on, until it wasn’t. The Observer failed to produce a single shadow minister to confirm the story. Johnson repeated what he had said before – he wasn’t interested. But: when the proverbial hit the fan, where were Miliband’s supporters? Who spoke up, who rallied round? Late in the day, the non-factionalist leader has realised he needs a stronger core of supporters around him. The (non-) coup may have amounted to nothing. But it was a warning that Miliband needs to do more to keep a nervous party happy.. This year’s Labour Party Conference was the first I’d ever been to. It was an interesting experience. Most of the post-conference analysis recycled the same kind of ideas. It was “flat”; it didn’t feel how a party’s last conference before a general election should; and, there was the still cited, widely agreed view that Miliband’s speech didn’t do the job it needed to. However, what I found interesting, and a little disheartening, is that it felt like a world unto itself. Most of what was discussed at the Conference centre in Manchester, and in the days following, was between the same people who occupy the political world. All the while, beyond the security barriers, the rest of the city – and country – carried on as usual. None of this is to say conference isn’t an important place for activists and party supporters to gather to discuss their ideas. But as someone who finds the political world daunting, it reminded me that Labour (like all other political parties) sorely need to broaden whose voices they hear. Otherwise, party politics will continue to narrow and won’t offer real solutions to the problems facing many people in this country. The Labour Party didn’t just have one UKIP-based brush with disaster this year, it had several. There was losing the European elections of course (an avoidable and depressing result that the party have largely sought to airbrush from history, and for good reason) and there were the two UKIP by-election wins in Tory seats following Blue>Purple defections (and Labour came nowhere in either). But the party’s biggest UKIP-based shock this year came in an election that Labour won – the Heywood and Middleton by-election. To come within a few hundred votes of losing a “safe” Northern Labour seat to UKIP was a real shock to the system for Labour activists (and some in the leadership) and the idea that UKIP are just a Tory problem was further exposed for the fallacy that it is. UKIP have the capacity to make real inroads into Labour’s heartlands unless the party takes the appropriate action to head off their ascent. And it really doesn’t bear thinking about what would have happened if UKIP had won Heywood and Middleton. Miliband’s leadership would have faced its most severe challenge (and it has after all been challenged many times) – and with a bit more resource, a better candidate or perhaps just a visit from Farage on polling day, UKIP could have won two by-elections at once.